With the success of Aquafina Water, which is a bottled water brand produced by their rival PepsiCo, The Coca Cola Company launched another brand of bottled water in 2oo2 and it was called Dasani. The product is just one of the many brands of bottled water under Coca Cola and is described as filtered tap water with added trace minerals. As mentioned, Coca Cola uses tap water from local municipal water supplies. Then, the water goes through a filtration process using reverse osmosis. Reverse osmosis is a water purification technology, which removes ions, molecules, and other larger particles from drinking water. The process can remove dissolved and floating species from water, including bacteria. Below are the latest Dasani Water prices. The Coca Cola Company is one of the biggest brands in the world and it is just right that they regard product safety very seriously. They are very dedicated to meeting and even exceeding the regulatory product quality standards that are set by the government. One of the things that sets Dasani Water apart from the other bottled water brands is its sustainability efforts. The bottles used in packaging Dasani Water are 100% recyclable, including the cap, label, inks, and glues. To ensure that, Coca Cola worked closely with the recyclers during the initial design process of the bottle to make it ideal for recycling. 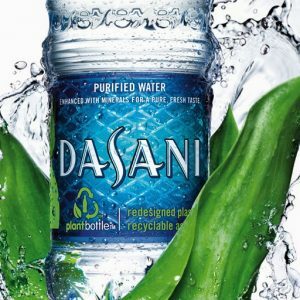 In fact, Dasani Water uses PlantBottle in an effort to reduce any negative effects of using plastic bottles on the planet. PlantBottle packaging uses up to 30% sourced from sugarcane by-products from Brazil. By doing this effort of using up to 30% plant based materials, Dasani Water reduces reliance on non-renewable resources and lowers the carbon footprint on the planet. That, as we all know, is great for our environment. Dasani also reduced the weight of their bottles so that less plastic will be required in the production. Using less plastic helps conserve the natural resources and lowers the emission of carbon dioxide. As a matter of fact, since Dasani was introduced, the company has reduced the amount of plastic that they use in their 500 ml bottle by more than 40%. Additionally, the weight of their 20 fluid ounce bottle was also reduced by 22%. What’s more interesting, and even greater news for the environment is that the half liter bottle can be twisted down to half its size, which means more space in the recycle bins. Also, recycled bottles are not just used to create more Dasani bottles, they can also be used to create backpacks, shirts, rugs, and shoes. Individual sizes of Dasani Water are available in 20 fluid ounces, 24 fluid ounces, 1 liter, and 1.5 liter. It can also be bought in multi-packs for those who want to stock up. As mentioned earlier, Dasani Water is taken from the local municipal water supplies. Then, it is filtered for purity using state of the art water purification technology called reverse osmosis. This technology uses semipermeable membrane to remove impurities from drinking water. After the rigorous process of reverse osmosis, a special blend of minerals, including salt, is added to have Dasani’s distinct pure, crisp, and fresh taste. Although Coca Cola does not disclose the amount of minerals that they add to the water, they assure that the amounts are so diminutive that the US Food and Drug Administration consider the additives as “dietarily insignificant”. FDA also considers Dasani Water as a very low sodium food. To ensure the freshness of Dasani Water, and to maintain its crisp and refreshing taste, it is best to keep it for up to 12 months only. Aside from Dasani Water, there are also other variants available in the market. There is Dasani Sparkling Water which is an unsweetened and naturally flavored sparkling water beverage. It has zero calories and does not contain any juice. The original flavors include Sparkling Black Berry, Sparkling Berry, Sparkling Lime, Sparkling Raspberry Lemonade, and Sparkling Tropical Pineapple. Because of its success, new flavors were introduced and they include Sparkling Meyer Lemon, Sparkling Strawberry Guava, Sparkling White Peach, Sparkling Blood Orange, Sparkling Watermelon, and Sparkling Pink Grapefruit. There is also Dasani Flavors, which is Dasani Water with a touch of natural fruit flavor. It does not contain any juice as well and is available in Lemon and Strawberry flavors. Dasani Drops is another Dasani product which is used to enhance the water’s taste with a squeeze of natural fruit flavor. It does not contain any juice, has zero calories, and contains 32 drops per bottle. The available flavors are Strawberry Kiwi, Pineapple Coconut, Pink Lemonade, Watermelon Punch, Pear Acai, and Orange Passionfruit.